The time has finally come for fans to get their first real preview of Reese Witherspoon and Jennifer Aniston’s new television show for Apple TV. We’ve been talking about casting and the vague details of the plot for some time now, but on Monday, March 25, we finally got our first honest-to-goodness presentation about the show. Now titled The Morning Show, Witherspoon, Aniston and their costar, Steve Carell, all took the stage at the latest Apple Event in Cupertino, California and wow, we loved what we saw. The Apple Event preview also included the first look at The Morning Show and included scenes from show, like one showing off the set of the fictional morning show where Aniston’s character will serve as an anchor and another showing Witherspoon’s character walking onto the set for the very first time. In addition to a preview of The Morning Show, other new Apple TV series like Truth Be Told starring Octavia Spencer were previewed for the eager audience. With this first sneak preview delivered to the world, it’s only a matter of time before we get to see a trailer dedicated to just The Morning Show. And that wasn’t the only preview shown at the Apple Event. 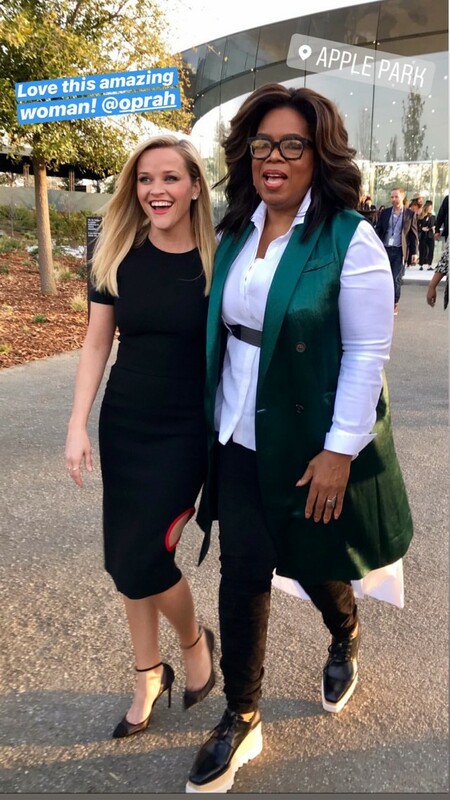 In addition to the official footage shown at the actual event, Witherspoon posted photos and a sweet video to her Instagram taken at a cocktail hour (which presumably happened after the event) that featured all of the other actors, directors, producers and exectives involved in getting these Apple TV shows off the ground. 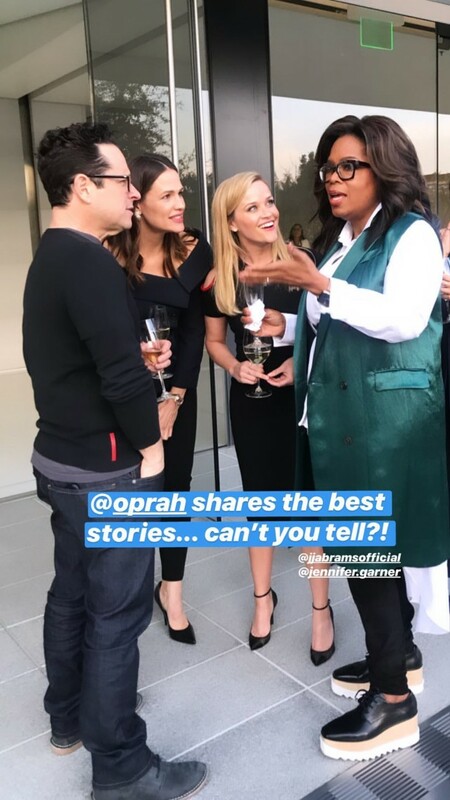 In the Instagram video, Witherspoon is seen hanging out with pals Jennifer Garner and Oprah Winfrey, laughing and smiling. 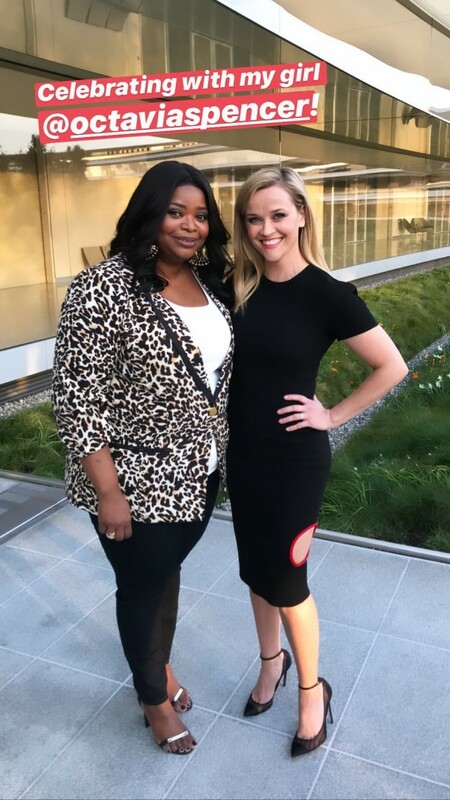 Winfrey is heard quipping, “I think we’re Apple girls” as Witherspoon and Garner nod in agreement, reveling at being a part of a new TV family. There is no confirmed premiere date for The Morning Show but, suffice it to say, our eagerness to finally dive into this show is at a fever pitch.